Directly after the Second World War, most light commercials were derived from passenger cars, usually small and of very limited carrying capacity. Typical of these was the Morris Eight van, which would struggle to cope with more than five hundredweight of potatoes or to reach 50 mph. By comparison, the Ford Transit of 1965 would carry three times that amount, drove like a car and did 70 mph with ease. In this book the manufacturers - large and small - are dealt with in A-Z order: Austin, Bedford, Bond, Commer, Douglas, Ford, Jowett, Morris, Morrison, Reliant, Standard, Triumph and Trojan. 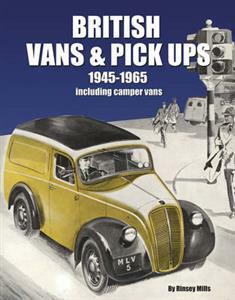 The author gives a brief history of each and then provides detailed coverage of the various models produced, using the original manufacturers' publicity material for the illustrations not only to identify the vehicles but also to give the flavor of the times when they were to be seen going about their business.